This skin-reviving hand cream is naturally nurturing to hydrate, nourish and soothe dry hands. Enriched with organic Perilla, Evening Primrose, Aloe Vera and Shea butter to soften and protect your hands and cuticles. Aqua, Butyrospermum Parkii Butter*^, Helianthus Annuus Seed Oil*, Glycerin*, Olea Europaea Fruit Oil*, Squalane, Cetyl Alcohol, Cetearyl Glucoside, Cetearyl Alcohol, Perilla Frutescens Seed Oil*, Elaeis Guineensis Oil*^, Simmondsia Chinensis Seed Oil*, Glyceryl Stearate, Aloe Barbadensis Leaf Juice Powder*, Oenothera Biennis Seed Oil*, Althaea Officinalis Root Extract*, Rosmarinus Officinalis Leaf Extract*, Chamomilla Recutita Flower Extract*, Aroma [Rosa Damascena Flower Oil*^, Jasminum Officinale Flower Extract*, Citrus Limon Peel Oil*, Origanum Majorana Herb Oil*, Citrus Aurantium Leaf Oil*^, Ocimum Basilicum Herb Oil*, Lavandula Angustifolia Herb Oil*^, Pelargonium Graveolens Oil*^, Cananga Odorata Flower Oil*^, Cinnamomum Camphora Bark Oil, Styrax Benzoin Resin Oil], Hydrolysed Jojoba Esters, Sodium Lauryl Glucose Carboxylate, Lauryl Glucoside, Sodium Stearoyl Glutamate, Benzyl Alcohol, Salicylic Acid, Sorbic Acid, Benzyl Benzoate, Benzyl Salicylate, Citral, Citronellol, Eugenol, Farnesol, Geraniol, Limonene, Linalool. Apply a small amount and massage into the hands, including the cuticles. Re-apply as often as required. 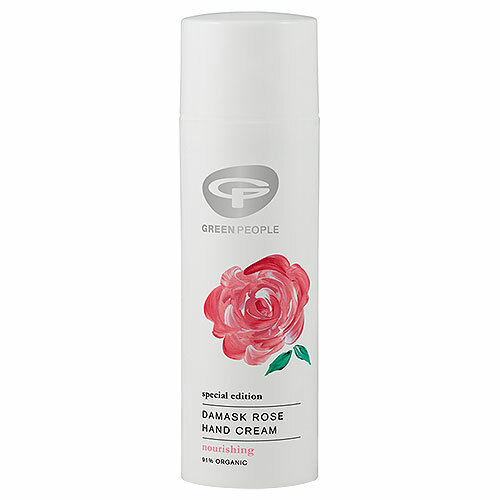 Below are reviews of Green People Damask Rose Hand Cream - 50ml by bodykind customers. If you have tried this product we'd love to hear what you think so please leave a review. This skin-reviving hand cream is naturally nurturing to hydrate, nourish and soothe dry hands.